You’ve probably heard the phrase “Tarot is a Mirror of the Soul.” Certainly any reading can be examined from this perspective, giving you an ever-changing kalidescopic view of the self and your concerns. Here, though, is a fun way to make the Major Arcana your own. This personal process (it’s not a spread as you’d normally think of it) provides a way to view a deep reflection of your Soul-Self that probably won’t change much until (or unless) you do. Take out your favorite Major Arcana deck—the one that speaks most expressively to you. Arrange the Major Arcana in order from the card you like and admire the most to the one you find the scariest and most fearful. Take one card which fits the least into your personal sequence and put it aside. 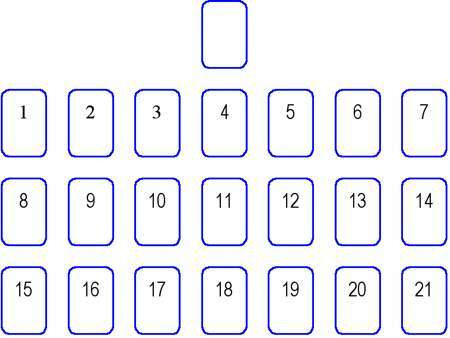 Next, keeping the cards in the order you’ve just determined, lay your Major Arcana out in three rows of seven cards as shown in the diagram below. Put the one card that “fits least” in the single position at the top. Now comes the fun part. Examine each three-card column such that the top card in a column indicates your Ideals, the bottom card is its Shadow, and the middle card Mediates between these two. The mediating card can be seen as that which makes it possible for the Ideal and Shadow to relate to each other. For instance, if you have the Sun as your Ideal and the Tower as its Shadow with Justice mediating, then Justice helps each to see that the other is necessary for a just balance. On the other hand, if Temperance is the Ideal and Death its Shadow, and the Wheel of Fortune mediates, then the Wheel reminds you that Temperance’s mixture of elements has to include the season of Death as part of its cycle. Look at these cards in terms of how you handle and respond to situations. When you are striving for an Ideal, how can you integrate its Shadow? When you are annoyed or afraid, how can you call on your positive Ideal? Use the mediating card as a practical key to this integrative process. How does the card you placed at the very top, the one that “didn’t fit,” seem to comment on all the others or, perhaps, lend an overall theme to the whole? Do it once, save the results somewhere where you will “stumble” upon them in 6 months or a year. Re-order the Major Arcana of the same deck again (from the ones you like most to the ones you find most scary and disturbing) and see where your sequence has stayed the same as last time and where it’s changed. This is great, Mary, thanks for sharing it! We did some more creative work with your 3-Card Draw today at Living Tarot. We did it with Birth Cards! Fun as heck. Your three-layer model on the Majors is a perfect nightcap for the days’ adventures in this regard. As always, love your scholarship, and scholarship your love. thank you very much for your article, there s always something to learn here! I loved this spread and find it one of my best tools for self-analysis in my possession at this point. Im so glad that several of you have found this spread so worthwhile.